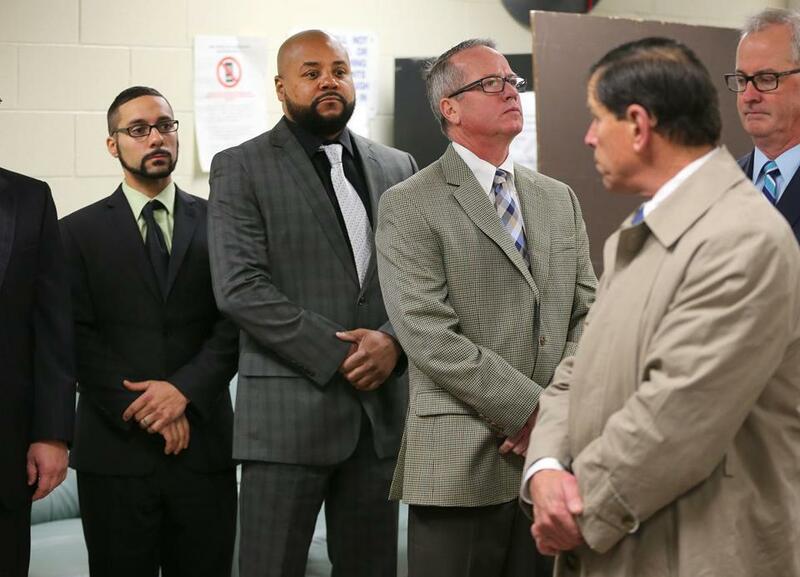 Ex-guards on trial (from left) John Raposo, Derek Howard, and George Billadeau, with Judge Jeffrey Locke (right, looking back at them), on Wednesday visited the facility where Joshua Messier died. PLYMOUTH — On the second day of the trial of three prison guards facing charges in the death of a schizophrenia patient at Bridgewater State Hospital, the Plymouth Superior Court judge hearing the case and a coterie of lawyers on Wednesday toured the facility and the narrow, cinder-block cell where 23-year-old Joshua K. Messier lost his life. The visit to the medium-security prison began in the break room of a dormitory where Messier allegedly fought with two guards and continued into a corridor where he was subdued by more than a half-dozen other guards, placed in leg irons and handcuffs, and escorted out of the building, on the evening of May 4, 2009. Superior Court Judge Jeffrey A. Locke and others on the tour then walked across a long outdoor courtyard — a distance of some 600 feet — into Bridgewater’s old Intensive Treatment Unit, where Messier was killed as guards crowded into his cell and wrestled him into four-point restraints, strapping his wrists and ankles to a small bed. Because the guards chose to have Locke hear their case without a jury, it will be up to him to decide whether they should be found guilty of involuntary manslaughter and criminal civil rights violations. He paused during the tour to ask questions about the layout of Cell 13, where Messier was killed, and to consider the long walk from the dormitory to the ITU. The tour was an essential supplement to crucial video evidence, which is grainy and repeatedly skips frames while depicting the guards as they moved Messier from a waiting room, where they say he had calmed down, into Cell 13 of the ITU, where they sat him on a bed with his legs extended in front of him and his hands cuffed behind his back. 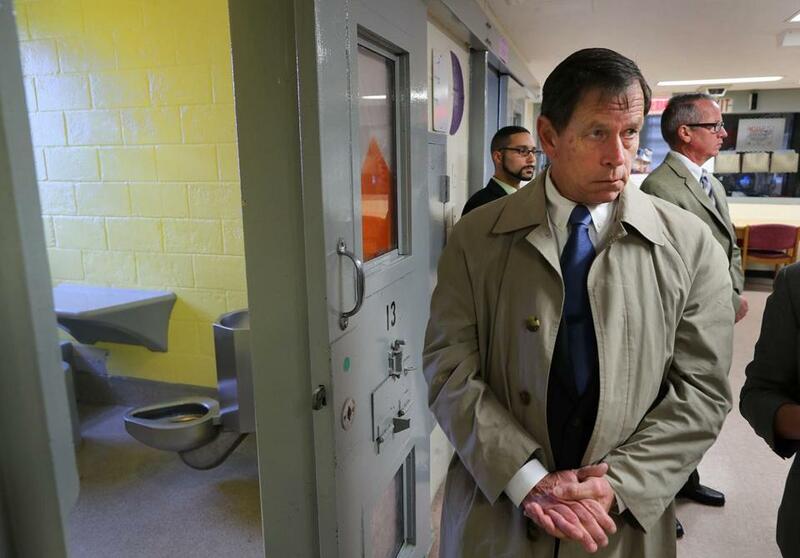 Judge Jeffrey Locke stood outside cell 13 where Messier died. Two of the three guards — Derek Howard and John C. Raposo — are accused of then pressing down on Messier’s back and folding him over at the waist in a maneuver sometimes called “suitcasing” that is barred in Massachusetts prisons because it can cause suffocation. The third guard, George A. Billadeau, was the acting lieutenant in charge and is accused of failing to adequately supervise Howard and Raposo. Martin F. Murphy, the special prosecutor in the case, said in court Tuesday that the guards violated three additional key rules designed to govern the use of four-point restraints at Bridgewater: obtaining prior approval from a mental health clinician; never using more force than necessary; and using restraints only when there is an emergency where violence or the threat of violence has occurred, and never for punishment. But on Wednesday defense attorneys, while questioning several witnesses after the trip to Bridgewater, made the case that the guards were following a “de facto policy” — or general practice — of routinely placing patients in four-point restraints before obtaining mental health authorizations. One witness, retired Sergeant Daniel J. Kerr, who was in Messier’s cell the night he was killed, also said that once a decision was made to place a patient in four-point restraints, the decision was irreversible, whether or not the patient had grown calm, as was the case with Messier. Defense attorneys also established — repeatedly — that the guards received inadequate training in the use of four-point restraints, while noting that the guards were not permitted to view the medical files of mental health patients, or to learn which medications they might be taking, or how those medications might be affecting their behavior. One of the guards on trial, Derek Howard, walked to the entrance of the facility. 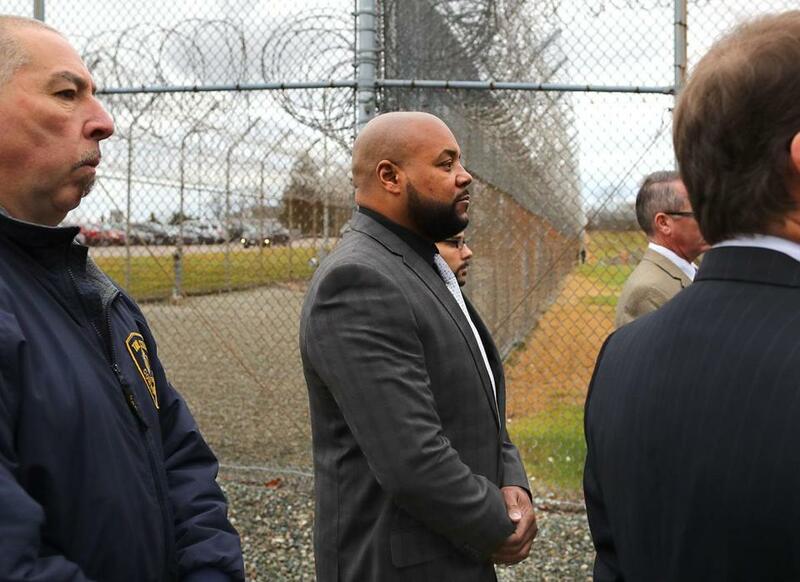 Defense attorneys also tried get Anahory to agree that the Department of Correction investigated Messier’s death and fired the three guards “five years after the fact” only in response to a Boston Globe investigation published in February 2014. But Anahory would not agree and Judge Locke refused to accept the news story into evidence. The Globe reviewed the circumstances surrounding Messier’s death after his parents filed a civil lawsuit and Plymouth District Attorney Timothy J. Cruz said there was insufficient evidence to pursue criminal charges, even though the state medical examiner’s office ruled Messier’s death a homicide. After a five-month investigation, the Globe found that guards in the case violated more than a half-dozen laws, regulations, and policies, and that top officials in the Department of Correction covered-up the circumstances surrounding Messier’s death. 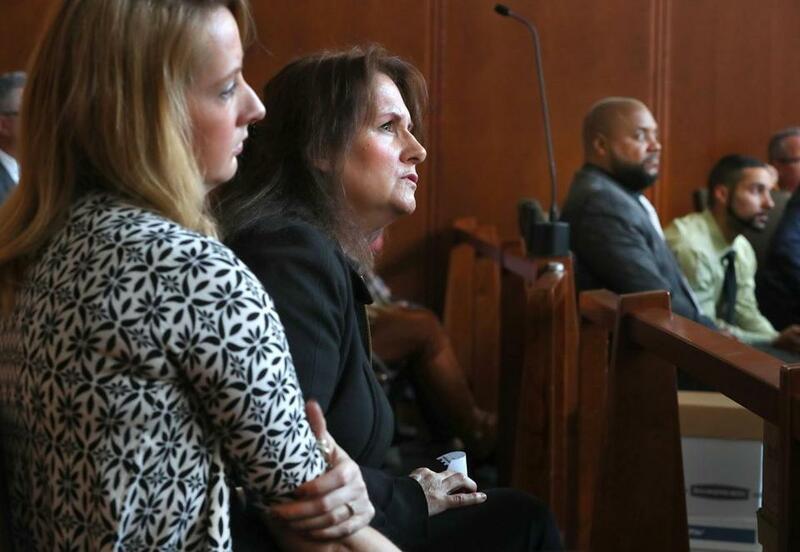 Joshua Messier's mother, Lisa Brown (left) and sister, Danielle looked at an image projected on a screen in the courtroom, as two of the three guards on trial, Derek Howard (left rear) and John Raposo looked on.